Guitarist DJ Ashba has announced his departure from Guns N’ Roses after six years with the band. 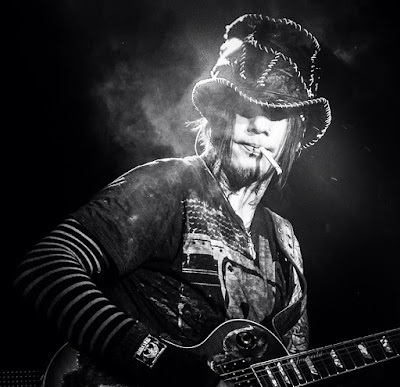 Ashba plans to focus on Sixx:AM as they prepare to release two albums in 2016 alongside a planned 2-year world tour. The guitarist joined Guns N’ Roses in 2009 as a replacement for Robin Finck, who left to rejoin Nine Inch Nails at the time. On Monday, Ashba posted a statement on his social media with the news of his exit from Guns N’ Roses. “6 years ago I received a call that changed my life forever,” writes Ashba. “The call was from a dear friend of mine (Katie McNeil-Diamond) who was working with Guns N’ Roses. It was an offer to audition for Axl Rose and earn a role in arguably the biggest rock band of my time. While I thought it was a complete long-shot, I decided to go ahead and give it a try. Much to my shock and surprise, I got the gig. And so began the most incredible journey I could have possibly imagined. “I was blessed with the opportunity to not only work with one of the most talented bands but also to share the stage with a living legend and a truly gifted human being, Axl Rose. The amount of confidence and trust that Axl placed in me was genuinely heartwarming and truly career-defining. “In the years that followed I traveled the world many times over and played these incredible songs night after night to the most enthusiastic and loving crowds. As you can imagine, the friendships that were forged during that time were deep and long lasting. But the most beautiful surprise of all was YOU... the fans. You welcomed me into your lives with open arms and showed me love and support that I could only have dreamed of. From the very first time I stepped on stage and started playing "Welcome To The Jungle," and felt the crowd erupt, I knew my life would never be the same. I'm not gonna lie...I was terrified!! But you were so accepting. You immediately turned my fear into pride. For that, I am truly grateful. “So now it is with a very heavy heart and yet great pride that I announce that I've decided to close this chapter of my life and encapsulate the wonderful times that I've shared with Guns N’ Roses into fond memories. I have reached a point in my life where I feel its time to dedicate myself to my band Sixx:A.M., my adoring wife and family, and to the many new adventures that the future holds for me. I have always been driven by my passion for creating music and Sixx:A.M. has always been a place where I can express myself honestly and share that passion with my two brothers and bandmates, Nikki Sixx and James Michael. As you know I have also been blessed with the love and support of my incredible wife, Naty, who has been at my side for much of this amazing journey. “As I sit here writing this letter, I want to take a moment to thank Axl from the bottom of my heart for not only the most incredible experience of my life, but for truly believing in me. You are a true friend and a champion of mine and I am forever grateful. And even as I move on to pursue other endeavors, I will always remain one of your biggest fans. I also would like to thank each and every one of you fans for your love and support throughout the years. Without you, I am nothing. Please know that I do not take one minute of this amazing life for granted. Currently on hiatus from touring, Guns N’ Roses' last live performances with Ashba were part of a spring 2014 residency at the The Joint at the Hard Rock Hotel and Casino in Las Vegas.